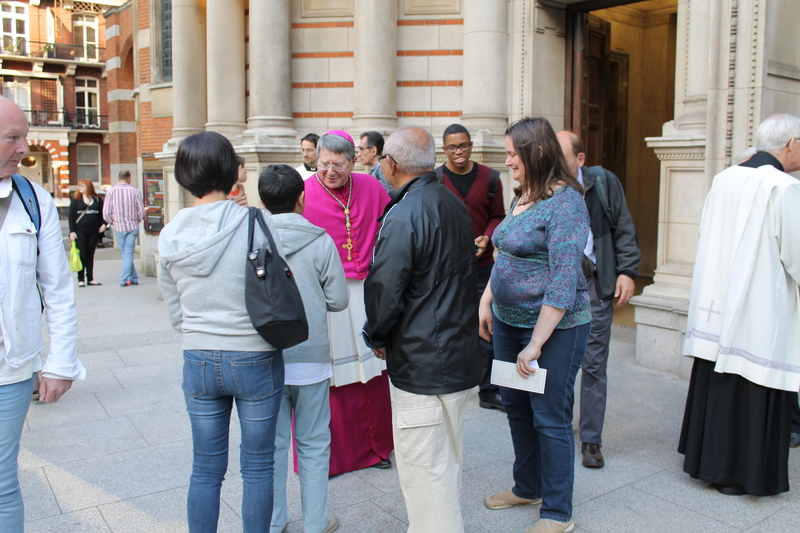 The Ordinary of the Personal Ordinariate of Our Lady of Walsingham, Monsignor Keith Newton, has told thousands of Mass-goers in Westminster Cathedral that many Catholics are unaware of – or misunderstand – the Ordinariate. He said it could be quite distressing for Anglicans who had made a difficult journey in order to enter into full communion with the Catholic Church to be asked, for example, why they did not become “proper Catholics”. Mgr Newton’s comments were made during a preaching visit to the Cathedral last weekend (June 8/9) where he was invited to make a financial appeal on behalf of the Friends of the Ordinariate which supports it practically and financially. Mgr Newton used the occasion to speak of an initiative organised by “the Friends”, with the support of Archbishop Vincent Nichols as President of the Bishops’ Conference of England and Wales, the aim of which is to deepen understanding of the Ordinariate and present afresh the contribution it is making to the life of the Church. Addressing the misunderstanding issue, Mgr Newton told the Cathedral congregation that he wanted to make it clear that members of the Ordinariate, both religious and lay, were just as much Catholics as all those who belonged to the Diocese of Westminster. “Our priests are just like any other Catholic priests; you can attend Mass with an Ordinariate congregation with an Ordinariate liturgy and fulfil your obligation, just as you would by going to Mass in any Catholic church anywhere in the world”, he said. The Ordinariate was set up by Pope Benedict XVI to allow Anglicans to enter the full communion of the Catholic Church while retaining much of their spiritual, liturgical and pastoral tradition. Mgr Newton also spoke of the great joy and many blessings that Ordinariate members had experienced since joining the Catholic Church and of how its clergy were serving in the wider church as chaplains in prisons, hospitals and schools or as diocesan parish clergy. He quoted Pope Benedict’s description of the Ordinariate as a “prophetic gesture” to promote Christian unity. This, Mgr Newton said, was a “high calling” and he urged Catholics to pray for the Ordinariate and support it. Members of the congregation queued to speak to the Ordinary after the Masses. Catherine Utley, the fund raising co-ordinator of the Friends of the Ordinariate, said: “It was a great atmosphere. There was real warmth and interest and excitement. Westminster Cathedral is the Catholic Church in microcosm and people of all ages and of all nationalities were coming up to me saying they hadn’t known about the Ordinariate before and they thought it was wonderful. We are really grateful to the administrator of the Cathedral, Canon Christopher Tuckwell, for having given us this opportunity to inform people and spread the good news about the Ordinariate”.